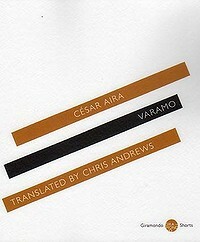 A Writerly Experience: Petrina Meldrum reviews ‘Varamo’ by César Aira (Trans. by Chris Andrews). Roberto Bolaño’s quote on the back cover of Varamo, ‘If there is one contemporary writer who defies classification, it is César Aira’, provides us with an insight into what we are about to experience as we enter the covers of this book. Varamo flies in the face of all expectations of what a novel should be, something it’s author, César Aira, would be proud of. For Aira, writing a novel is a work of art—something so individual and personal, that the result should be capable of confounding even the literary critics. Credit should be given to Sydney-based Chris Andrews for an excellent translation which allows us to read Aira’s work in the spirit in which it was written. If you are looking for a plot to follow this is not a book for you, you need to be prepared follow the flow. In various essays and interviews Aira tells us that he does not have a plan, his method is to keep moving forward without looking back or editing what he has already written. If this is true he is an exceptionally talented writer with a clarity of thought to be envied. In under one hundred pages, in a time frame of less than twelve hours, Aira tells us the rich and dense tale of a Panamanian civil servant, Varamo, who on this particular day, having been paid his salary for the month in counterfeit notes, follows his daily routine ‘overwhelmed by anxiety’. Unmarried at fifty, still living with his Chinese mother (a tale in itself), Varamo is a born worrier who analyses everything before acting. When things go wrong, and they often do, he asks himself, ‘Why me of all people? Why me?’ only to conclude that everyone else could be saying the same thing. In the middle section of Varamo, the narrator takes time out of the story to explain to the reader, at length, not only the benefits of using the free indirect style of narration, but also that everything we have read so far is not taken from historical data, as in fact no such data exists; it is merely what literary critics have deduced from the content of the book (a list of the information contained on all the scraps of paper Varamo has accumulated in his pockets during the preceding ten to twelve hours) written by Varamo at the request of the three publishers; the book that became the celebrated masterpiece. This is clearly a dig at literary criticism and is executed with wry humour. Handled equally well is the section towards the end of the book which deals with the publishing industry—purported to relate to pirate publishing in Panama, but to which I suspect Aira wishes to attribute a more universal relevance. I doubt that anyone has ever crammed so much into a hundred pages; it is impossible to do justice to all the detail here. Aira has published over seventy of these short novels. Unfortunately Varamo is only the seventh to be translated into English from the original Spanish. The next one, due out later this year, also translated by Chris Andrews, is Shantytown. But take care, I suspect these novels are addictive. Petrina Meldrum is a Tasmanian based writer with an MA in Creative Writing from the University of Tasmania. Her short stories for adults and children have appeared in a number of publications. She is presently working on a novel. This entry was posted in César Aira, Giramondo, Issue 8, Petrina Meldrum, Varamo and tagged literature, writing by Mark Roberts. Bookmark the permalink.